Remember uncola? Consider the Volvo V90 the unSUV. It does most everything a sport utility can, yet it's more fun to drive and costs less to operate. The clear, colourless soft drink brand in question made a lot of hay by pitching itself as the cleaner, more refreshing alternative to the darker, caffeinated beverages of the time, making me wonder if Volvo might want to be a bit bolder about the benefits of sport wagons versus sport utilities. 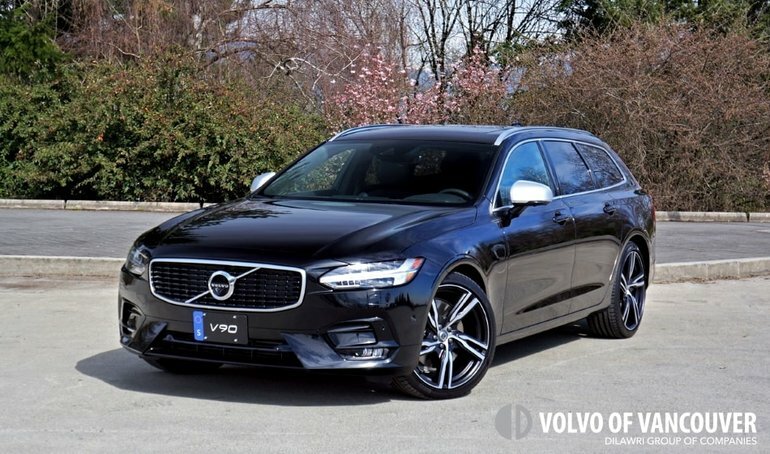 The Swedish brand currently offers two five-door wagon models, including the most recently redesigned compact V60 and this still fresh and oh-so good looking mid-size V90, while both only have one luxury competitor apiece. My tester this time around was the 2018 V90 in T6 R-Design trim, which in Volvo-speak means that I had the sportiest of its three trim levels, showing second on the brand's rung of aspirational feature sets, yet for the most part on the same level as top-tier V90 Inscription trim. To clarify, the V90 is offered in $60,500 base (but by no means basic) Momentum trim, $65,100 R-Design guise, or lastly as the $66,700 Inscription. As you can see there's little price differentiation from R-Design to Inscriptions trims, so both can be considered top of the line. It really comes down to priorities. Personally, I'm more attracted to this sportier R-Design model, but I must admit to really liking the design of this practical five-door sport wagon no matter the trim. Before delving into details, I just wanted to highlight the incredible lengths that Volvo has taken in order to up its game when it comes to fit, finish, premium materials, attention to detail, technology leadership, powertrain advancements, and just generally providing an awe inspiring sense of occasion that at the very least measures up to its German contemporaries, and often surpasses them. A quick review of features shows you'll be getting an impressively outfitted car no matter which version you choose, with the base Momentum including standard 18-inch alloy wheels, auto on/off "Thor's Hammer" LED headlights with active cornering and high-pressure cleaners, fog lamps, proximity access, pushbutton start, an electromechanical parking brake, a leather-wrapped multifunction steering wheel, a leather shift knob, rain-sensing wipers, a powered panoramic sunroof, an auto-dimming rearview mirror, an 8.0-inch digital gauge cluster, Road Sign Information (RSI), adaptive cruise control with Pilot Assist semi-autonomous driving capability, dual-zone automatic climate control, a large tablet-style touchscreen filled with one of the best infotainment interfaces in the industry, a clear backup camera with dynamic guidelines, rear parking sensors, accurate navigation with detailed mapping, 224-watt 10-speaker audio, satellite radio, Volvo On-Call featuring remote start and vehicle tracking, active noise control, leather upholstery, heatable power-adjustable front seats including four-way lumbar and driver's memory, power-folding rear seat headrests that flip down to make seeing rearward easier when no passengers are in back, power release folding rear seatbacks, a hands-free powered liftgate, and more. Whew! That's a long list, and Momentum is just the base model. Volvo never shortchanges its loyal clientele on standard safety features either, so along with Volvo's usual tire pressure monitoring, hill start assist, electronic brake force distribution, emergency brake assist, ABS, usual collection of airbags including one for the driver's knees, etcetera, the V90 comes equipped with autonomous front collision mitigation with pedestrian detection as well as a lane keeping aid, and the systems weren't overly sensitive so they gave off no false alarms, yet came into action each time they were needed. Autonomous in mind, aforementioned Pilot Assist won't completely take over the steering wheel, but as a precursor to full autonomous driving it works together with the adaptive cruise control to provide short-duration self-driving in the city and on the highway, so long as road markings are clearly visible. It works quite well too, but for the time being such systems are in their development stage and therefore are more novelties than anything particularly useful. I did find it helpful during bumper-to-bumper rush hour traffic, however, where it when about its business quite effectively, allowing me to relax a bit more than I would normally. R-Design trim enhances styling with unique diamond-cut 19-inch alloys framing an upgraded sport suspension, a special blackened grille and trim, matte silver side mirror caps, and silk metal side window trim, while inside it gets an even nicer perforated leather sport steering wheel with paddle shifters, metal foot pedals, a full 12.3-inch digital gauge cluster that's beautifully detailed and filled with functions, four-zone auto climate control that includes a panel with controls in back, a subwoofer for the stereo, richer Nubuck leather upholstery, ultra-comfortable contoured sport seats with added side bolstering and a driver's cushion extension that nicely cups under the knees for added support, unique Metal Mesh décor inlays, a black headliner, rear side sunshades, and plenty of R-Design branding. I won't go into too much detail regarding Inscription trim, but as noted before its feature set is much the same as with the R-Design other than the latter model's sportier theme getting replaced by a unique chromed waterfall grille and ritzier chrome elements on the outside, whereas the interior is pure class due to beautiful Linear Walnut trim and stunning perforated Fine Nappa leather. Also, take note the Inscription includes ventilated front seats, front passenger seat memory, and more. No matter the trim specified, everything comes together within a cabin that's not only beautifully finished as noted earlier, but also supremely comfortable and ergonomically ideal. Finding the perfect driving position is easy, and that's a big bonus for me as my shorter torso and longer legs don't always fit within Volvo's competitors. The V90 offers ample telescopic steering wheel reach and plenty of rakes, while the seat adjustments provide more than enough flexibility for most any body type to find a good position. The outboard rear seats are comfortable too, and especially supportive at the lower back while wonderfully sculpted with thick side bolsters similar to those up front, plus the flip-down armrest is wide and filled with pop-out cupholders as well as a handy lidded storage compartment. The large panoramic sunroof overhead offers an open and airy environment, while Volvo also provides real air via an excellent rear ventilation system that includes outlets on the backside of the front centre console plus additional vents on the B-pillars. Lastly, the three-way heatable outboard cushions noted earlier add rear passenger comfort on cold winter mornings. Those rear seat heaters will be appreciated when travelling home from a day on the slopes too, and thanks to ultra-useful 40/20/40 split-folding rear seatbacks they can be put to use while everyone's skis are placed down the middle. Volvo also finishes the V90's cargo area off beautifully, with a stylish metal cargo door protection plate that sits above another similar metal guard atop the bumper (this one a $155 option from the accessories catalogue), two of the nicest chromed tie-down hooks available from any luxury manufacturer, high quality yet durable carpeting most everywhere, and lastly a $215 reversible cargo mat from the accessories catalogue. What's more, V90's cargo cover is a technological marvel all on its own, automatically moving up and out of the way when the powered liftgate is opened, while below the strut-mounted load floor is a shallow but useful carpeted tray that sits above the compact spare tire and tools. If you're getting the idea that Volvo goes above and beyond to provide a new level of luxury to its fortunate followers, I'm glad. That's what I'm trying to convey, and it gets even better when factoring in the driving experience. It starts with the most advanced 2.0-litre engine available today, the Swedish brand's direct-injected four-cylinder benefiting from turbocharging as well as supercharging in order to make a stellar 316 horsepower and 295 lb-ft of torque. That's real V6 power from a fuel-efficient four, the Transport Canada numbers coming in at 10.6 L/100km city, 7.6 highway and 9.3 combined, which is excellent considering the performance available. Aiding the powertrain is an efficient eight-speed automatic with auto start-stop that shuts the engine off when it would otherwise be idling, reducing fuel consumption and emissions, but to just comment on this highly responsive transmission's wallet and environmentally friendly attributes wouldn't be doing it full justice, as, together with the aforementioned paddle shifters, it provides engaging hands-on performance that really ups the entire driving experience. Improving handling and stability in both dry and slippery conditions is standard all-wheel drive, but my favourite V90 attribute is its incredible ride quality. Together with the previously noted seats, the V90's cushioning ride is best in class, and that's even after factoring in my tester's $1,000 optional 20-inch eight-spoke silver diamond-cut alloys on 255/35 Pirelli P Zero performance rubber. My test car didn't include the $2,350 available Four-C Active Chassis and rear air suspension, however, which would have made it even smoother, while upping performance by automatically maintaining a constant ride height. The Four-C system utilizes the standard Drive Mode settings, which include Comfort mode, Eco mode, and Dynamic sports mode, but specifically enhances the suspension calibration of each, while the standard Drive Mode system enhances powertrain and steering characteristics, plus climate control in Eco mode. While we're on the subject of options, my tester also included deep, rich $900 Onyx Black metallic paint on the outside and $750 worth of sensational carbon fibre inlays inside, plus a $2,000 Vision Package featuring auto-dimming power-retractable side mirrors, Blind Spot Information System with Cross Traffic Alert, and one of the best 360-degree surround parking cameras in the biz; a $1,500 Convenience Package with a compass integrated into the rearview mirror, front and rear parking sensors, and Park Assist Pilot semi-autonomous self-parking; a $3,000 Leather package featuring Charcoal leather R-Design seats and a tailored leather dash top and door uppers; a $1,250 Climate package with heated wiper blades, a heatable steering wheel, and those heatable rear outboard seats noted earlier; an outrageously good $3,250 Bowers & Wilkins premium audio system with a 12-channel amplifier, 1400 watts of output and 19 separate speakers including a tweeter on top of the centre speaker that minimizes acoustic reflection from the windshield; and lastly a $1,150 Graphical Heads-Up Display that projects speed, speed limit info, navigation directions and more onto the windshield ahead of the driver, with everything listed pushing my V90 R-Design tester's list price up to $80,270 before freight and fees. 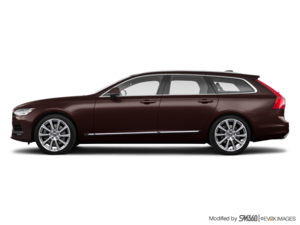 There were a few other options available, like rear entertainment, dual two-stage child booster seats integrated within the rear outboard seats, and the aforementioned suspension upgrade, but for the most part, this is a fully loaded mid-size Volvo sports wagon. After an enjoyable test that impressed me in every way, I'd find it difficult not to recommend the new Volvo V90, especially if you happen to appreciate the practicality of a larger five-door body style yet want the low-slung performance of a luxury sport sedan. The V90 is truly an excellent choice, and compared to its sole German competitor it's a superb value too.